Select if the question will have a single correct or multiple correct answers. 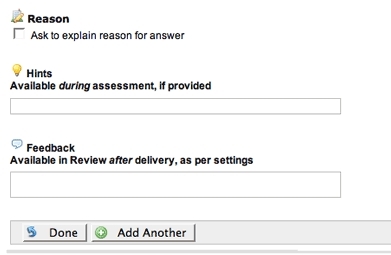 Single correct answers use radio buttons and multiple correct answers have check boxes to indicate the right answer(s). Put your choices into the boxes. Check the correct answers. If you need more choices than the default, choose how many more to add from the Add More Choices pop-down box. There is a 25-choice limit (that should be sufficient). 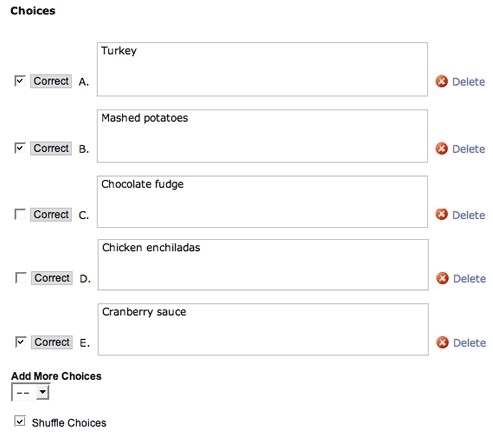 If you want the choices shuffled, click in the Shuffle Choices box. Otherwise, they will be displayed to students in the same order you enter them in this view. Delete Choice: You can delete a choice by clicking on the Delete link to the right of that choice.